The Wiggles are coming according to Louise. Just in case you missed it, the Hancock kids remind us that The Wiggles are coming. Lou is getting ready to go off to court, supported by Susan. Drew is round to take Lolly to see the famous Wiggles. Karl turns up, looking dashing in a suit, and they prepare to go. It's Paul's birthday and Tad has made a mix CD for him which he hopes will convert Paul to his kinda music. He didn't manage a Britney Spears birthday card though and Paul hopes she might be at the door but it's not, just Erinsborough's own pop princess, Flick. She isn't happy to hear that there's no party organised and takes the task on herself – she's the queen of PR. Tad is cautious, thinking about getting Harold's permission first, but Flick wants to get started right away. Lou tries to avoid the Allens but they spot him. John hates this – he's only doing this for the right reasons. He loves Louise. Lou thinks love involves sacrifice – therefore maybe he could leave her in a place where she's comfortable. 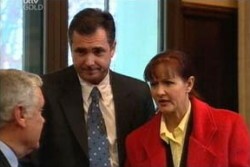 Karl tells Lou to come with him and they go inside the courthouse. Drew tells Toadie that Lou's already left. Toad's in full lawyer gear – he has to make a better impression with his employers this time. Lolly tells Toadie about the Wiggles, who he's obviously familiar with as he asks her to pass his regards to Dorothy the Dinosaur. 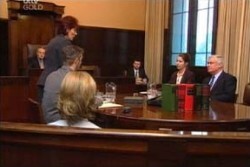 Drew isn't sure how things will go down at court and tells Toadie to phone later. Flick has her party organising hat on, inviting some of Tad's raving buddies to his party. Paul's mates are invited too, which means there could be some conflict over the choice of music. 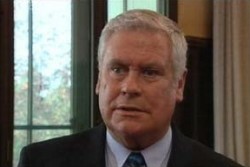 John Allen's lawyer tells the courtroom about how Lolly has had many carers since Cheryl died. In addition to this Lou has a history of drug dependence and he was recently fined for illegal trading. If that wasn't enough he's been married three times and has several kids, who all live interstate. Therefore he isn't the best choice to look after Louise. Drew runs into Paul, Tad and Flick, who aren't here to see the Wiggles, but to get food. Paul asks about Lou and Flick thinks they wouldn't take Lolly away. Karl is on the stand, saying that Lou took his advice about Narcotics Anonymous and that shows what kind of man he is. She asks if Lou's ever lapsed but Karl says that, to his knowledge, he has not. Susan takes the stand. She tells how her kids and Toadie babysat for Louise: the lawyer twists this into a bad thing – Lolly never had a permanent babysitter. Paul and Tad are very negative. Flick is going to message all their mates and when they come back from lunch there will be tons of people at number 22, ready to party! Flick, Tad and Paul are ordering drinks. While Flick and Tad are having beers Paul wants to pace himself, to Tad's incredulity. He thinks he should at least get something that says he's eighteen. Tad and Flick sit down and Tad moans about Paul being boring. Flick thinks he's cool and Tad thinks he's anything but. Susan and Karl have to leave and apologise about not being able to stay; they aren't sure if they helped but agree the barrister was a toughie. Lou thanks them and they go, just as Toadie appears. He's dropping off paperwork and Lou realises he's left his diary at work – it's really important and he really needs it for this. There's no way Lou can leave and Toadie can't get it as he can't be late at work again or he'll be fired. The Wiggles finish a song about Spaghetti and start another about parties. Is this really necessary? Karl and Susan bemoan their experiences before the barrister in court – she twisted everything and Susan didn't manage to tell them how great Lou is. Karl was rattled. Susan thinks they did the best they could. Karl thinks there's a bad feeling about the word addict but those who overcome addictions are the real heroes in society. He feels so bad – like he betrayed Lou. Susan reassures him that he did no such thing. Tad thinks Paul and Flick still haven't got the hang of 'coolth'. No one has got back to them about the party so it might just be the three of them. Toadie walks in and tells Tim, on his mobile, that he has a flat tyre and is delayed, before retrieving Lou's diary. Wiggle Mania. Drew had so much fun and thanks the guys for the show. Lolly tells the Wiggle in yellow that Emily has a sore tooth! 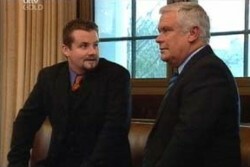 Toadie comes in with the diary just as Lou's about to be examined by John Allen's barrister. She asks him about his character: she wants to know how he would be the best custodian for Louise. Lou says he loves her and knows her, while John doesn't. The barrister brings up his tax problems, long hours, and drug dependency and Lou is furious, shouting that it's very unfair. She asks again, how he's a better person than the Allens to take care of Louise; the Allens, who are a young and successful couple. More cheesiness (after the Wiggles) ensues with Tad, Paul and Flick arriving home and finding loads of their friends, surprising them. But how did they get in? You won't believe this but the Wiggles are in Ramsay street, in their Wiggle car. 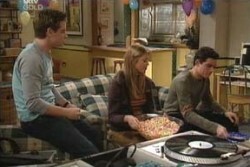 This is, by far, the craziest episode ever! They hear the music and decide to go to the party, after wondering if the car is parked too far from the kerb (but no one will mind as the people in Ramsay Street are nice.). They *skip* across the road happily. Tad and Paul realise that they don't know half of these people and the place is getting messy. 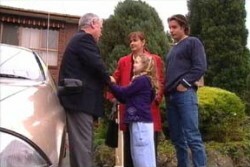 Flick suggests they do as her dad does and call the cops, pretending to be an annoyed neighbour. 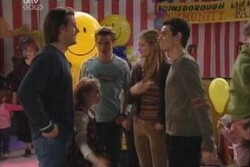 The Wiggles appear, asking for Emily and Flick invites them in, even though Emily doesn't live there. The teens are a bit surprised. LOU: Please don't take my little girl from me.